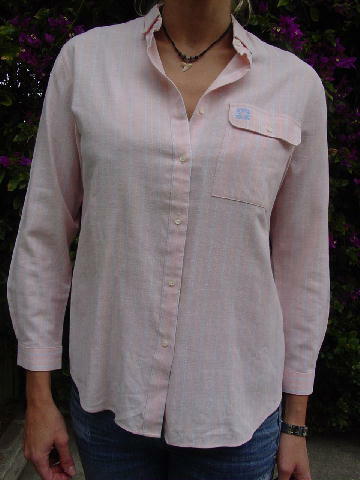 This vintage button-down shirt is by Anne Klein. 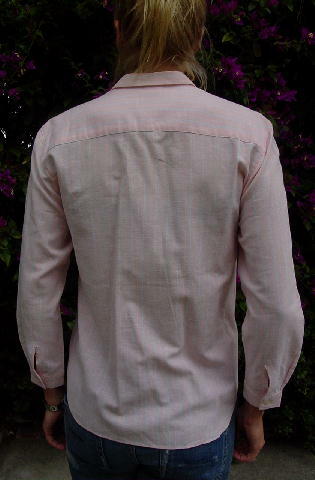 It has long sleeves with one button cuffs and 7 little pearlized white buttons down the front and 1 extra sewn inside. There is a one button flap breast pocket with a blue embroidered lion logo. There's no fabric tag, but it feels like a poly blend. It has a peachy-pink background with vertical lines in white, light red, and light blue. shoulder to bottom side hem 22 1/2"